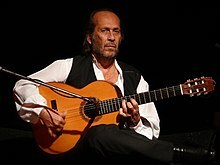 The Bienal de Flamenco is celebrated in Seville, Spain, in different theatres of the city. This festival features dancers, vocalists and guitarists direct from Spain in a display ranging from flamenco puro to innovative new works. The festival was first celebrated in 1980, with Jose Luis Ortiz Nuevo as the director and with a poster designed by Joaquín Sáenz. The Giraldillo (the festival award) was won by Calixto Sanchez. ^ "among them the first Giraldillo del Cante (1980)". Archived from the original on 2012-02-05. Retrieved January 21, 2012.